ANAHEIM, California – DigiTech today announced the introduction of its RP360 XP and RP360 multi-effects pedals, two guitar floor processors that offer over 160 effects and amp models, 198 presets, USB streaming for recording directly into a computer and much more. The RP360 XP and RP360 feature an all-new design that makes it easier than ever to access hundreds of sounds and lets players create their own personalized guitar tones. The RP360 XP and RP360 are identical except the RP360XP includes an expression pedal. Both provide state-of-the-art modeling of 82 stompboxes, 54 amplifiers and 26 speaker cabinets inspired by the world’s best-selling pedals and iconic amps. Along with the incredible variety of effects, the RP360 XP and RP360 offer 60 built-in drum patterns, a 40-second looper and numerous additional features. through all the RP’s presets, and Bank mode gives you direct access to 3 presets per bank. 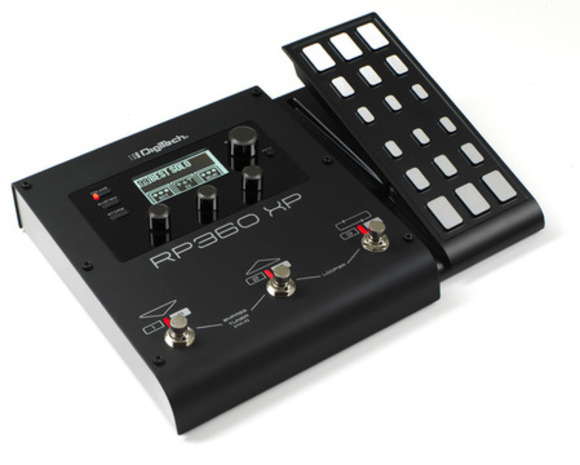 And the RP360XP’s expression pedal lets players control any of the effects parameters on the fly. Both pedals’ USB streaming audio capability allow recording to a computer using popular software such as GarageBand®, Pro Tools, Ableton, Cubase and others. In addition, DigiTech’s Nexus free preset editor lets users create, manage and load presets on the RP360XP and RP360 from their computer. Both pedals offer a host of additional useful features including a built-in tuner, headphone output, Sound Check™ that tests the settings of presets for the room’s acoustics and 1/4-inch inputs and outputs. The DigiTech RP360 XP and RP360 multi-effects pedals will be available in January 2014 at suggested retail prices of $199.95 and $149.95 respectively.